In the month of Ramadan, average daytime temperature and fasting duration in each destination will change from year to year. Combined with the GMTI 2016 scores of each destination which measures its overall Muslim-friendliness, this would result in changes in how a destination would rank in terms of its attractiveness for the Muslim traveler in Ramadan. From an overall global perspective, several patterns emerged as to how key regions such as GCC, OIC and Southeast Asia would change in terms of their overall attractiveness for the Muslim traveler in Ramadan. Key highlights of these macro-trends could be mapped out linearly over a span of 15 years. The impact of the changing average daytime temperature and fasting duration together with a destination’s GMTI score resulted in dynamic changes as to how a destination would rank in terms of its attractiveness for Muslim Ramadan travelers over the course of the next 15 years. This information was both useful for destinations to plan ahead in attracting future travelers, as well as for new migrants and travelers of these destinations who may need familiarize themselves with the changing Ramadan climate. In order to assist the traveler in understanding both dimensions of information in a clear manner, the data had to be presented from a user-designed perspective. After analysis, the analogy of a clock was chosen to represent the data, in this case a “Ramadan Destination Clock”. Global Macro-Trends could be mapped on the clock in terms of the key highlights for each year. 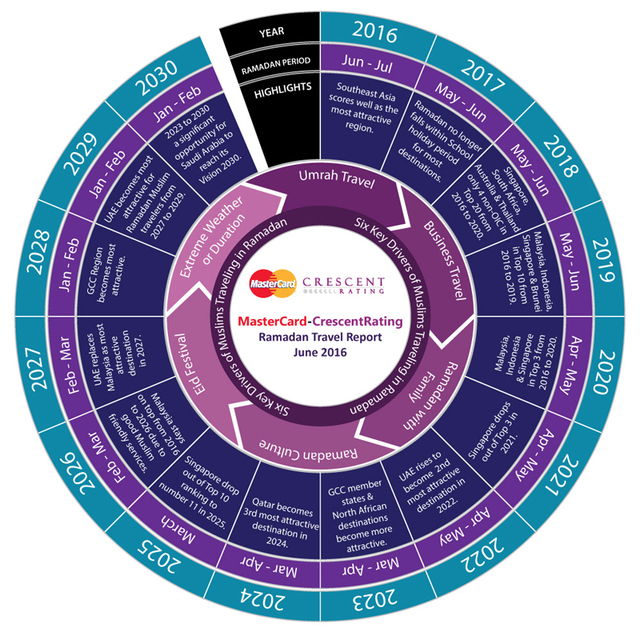 This resulted in a layered infographic which could capture multiple dimensions of year, Ramadan period, highlights as well as key drivers which shape these changes. As for the destination micro-trends, an interactive version of the Ramadan Destination Clock was produced to enhance the user experience. Travelers wishing to seek information regarding their specific destination could choose their location in which the destination’s fasting duration, average daytime temperature and ranking in terms of overall attractiveness in Ramadan would be displayed under highlights. With the Ramadan Destination Clock, destinations and travelers can now understand the key highlights of the MasterCard-CrescentRating Ramadan Travel Report in a quick, easy and interactive manner.